The heart is the organ that circulates and supplies oxygenated blood to all tissues in the body. What in turn helps the heart muscles function strongly to enable oxygen exposure and blood distribution to the rest of the body? Coronary circulation. A study conducted by the University of Minnesota revealed that the heart does not use the blood that it pumps. It is the coronary arteries that carry blood from lungs to be delivered to myocardium or heart tissues. Once the heart tissue is delivered oxygenated blood, it continues to pump blood to the rest of the body. Coronary arteries and veins lie on the surface of the heart and penetrate into the muscular heart layer, myocardium. These arteries that make up coronary heart circulation, branch from the aorta and surround the heart surface like a crown. Coronary arteries play a vital role in ensuring a normal cardiac functioning of the body. Cardiac muscles need oxygen from early in embryonic development until death. An embryo develops only with an adequate supply of oxygen. In early stages this might be provided by diffusion; but the rate of diffusion becomes slower with growth. Thus the circulatory systems start functioning early in development, often before other organs and systems in the body. The heart normally extracts 70 to 75 percent of the oxygen from blood in coronary circulation. This is more than the amount extracted by other organs from their circulation – such as 40 percent by skeletal muscle and 20 percent by liver. The two main coronary arteries supplying blood are the left and the right coronary arteries. The left main artery supplies blood to the left side of the heart muscle as well as the circumflex artery which encircles the heart and supplies blood to the outer side and back of the heart. The right coronary artery supplies blood to the right ventricle, the right atrium, the sinoatrial, atrioventricular nodes that regulate the heart rhythm. Cardiovascular efficiency is measured by how well the coronary arteries function. This also involves measuring the maximum volume of oxygen the body is consuming at the individual’s maximum heart rate. Whenever the heart activity is increased, the rate of coronary flow is increased. This also applies during decreased activity when the blood flow is slowed down. Coronary circulation thus helps in maintaining local muscle metabolism of the heart. If coronary blood flow is interrupted, there will be a lack of oxygen and within 30 seconds, lactic acid will build up resulting in cellular asidosis. A consequence of this is an inhibition of muscle contraction that occurs immediately after cessation of blood flow. A Coronary Artery Disease (CAD) is the gradual narrowing of the lumen of coronary arteries. When the walls of the coronary arteries thicken, it results in higher resistance to blood flow through the coronary arteries. This can eventually lead to complete blockage of the arteries. As a result, oxygen and nutrient supply to the myocardium drops below its demand. For people who are physically active, while exercising, the heart rate and blood pressure increases, thus increasing the heart’s demand for oxygen. The main way to increase oxygen supply is by increasing blood flow through dilation of coronary arteries. 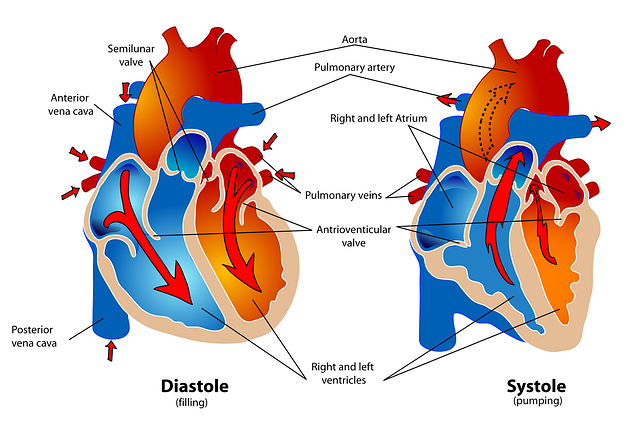 If they can’t dilate properly, the heart muscle may not be able to get the amount of oxygen it needs to function well. Thus, for the heart to never stop breathing, coronary circulation is important. Coronary artery is the leading cause of death worldwide. They are classified as ‘end circulation’ – representing the only source of blood to the myocardium; there is very little redundant blood supply, making the blockage of these arteries very critical. It occurs when the build up of plaque – a fatty material made of cholesterol, white blood cells and some smooth muscle cells – within the walls of arteries obstruct the flow of blood. Some individuals with coronary artery disease report pain radiating from the chest, but others remain unreported. If untreated, it can lead to myocardial infarction or a heart attack.